as possible - but like Nazism, it leaves no room for meaningful choice about enhancement." to believe that their very existence would be immoral in the era of human enhancement." Nicholas Agar occupies a position intermediate between bioconservatives like Leon Kass ("the wisdom of repugnance") and transhumanism. Transhumanists argue for the use of biotechnology to overcome our human limitations so we may all become "better than well". Agar's readable, humane-spirited and scientifically well-informed Liberal Eugenics defends reproductive freedom - the right of prospective parents to pursue enhancement technologies for their future children. Agar's demolition of the bioluddites is well taken. 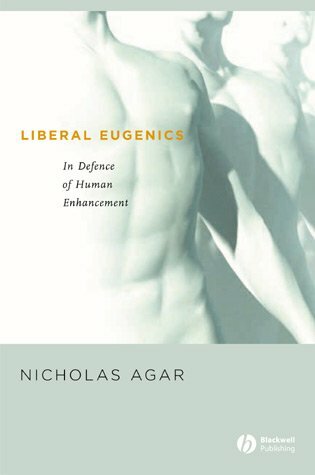 Agar also argues convincingly against both the spectre of a Huxleyan "Brave New World" and a coercive, fascist-style eugenics. However, Agar denies there will be any moral obligation upon parents to embrace the new genetic medicine and thereby maximise the well-being of our future children. Agar's objection to a future of genetically maximised superhappiness for all is twofold. 1) Classical utilitarianism is "monistic". In contrast to a warmer-sounding "pluralism", "monism" does indeed sound disturbingly totalitarian in spirit. A "monistic" ethic sounds especially sinister when coupled with allusions to the Nazis and the SS, a uniquely potent form of guilt by association. In reality, a world of universal mental superhealth would be not merely "less objectionable" than a world dominated by the ethos of Hitler's SS, but benign by its very nature: no one gets hurt. More instructive than any parallel with the SS is a comparison with the "monism" entailed by germline interventions to ensure physically disease-free lives: our more readily acknowledged obligation to do our utmost to ensure that our children don't suffer needless bodily distress, and enjoy abundant physical good health. Agar's parallel with membership of the racially elite SS is singularly inapt since SS membership was purposely designed to be exclusive, whereas the whole point of urging our moral obligation to maximise the well-being of everyone is that the injunction is inclusive: no child should be left out or left behind. Indeed the consistent utilitarian is adamant that (ultimately) members of no advanced species should be omitted from moral consideration: biotechnology should be used to promote the well-being of all sentient life. A commitment to the well-being of all sentience is written into the Transhumanist Declaration. The parallel between genetically pre-programmed physical health and genetically pre-programmed psychological health is worth exploring further in the light of Agar's worries about monistic ethics - and via the application of Agar's own "...method of moral images to help us make decisions about enhancement technologies. The moral image of an unfamiliar practice is another practice chosen both for its similarity to the problematic practice and the fact that it elicits moral reactions of which we are confident. If we have chosen our image well, consistency will demand that we react to the unfamiliar practice in the same way that we react to the familiar one." (Liberal Eugenics, p. 39) Whether members of Homo sapiens may ever be justifiably confident of our "moral reactions" is itself problematic (cf. "Hume's guillotine" i.e. the is-ought gap, not to mention recorded human history to date); but Agar's method may still be illuminating. The World Health Organization (WHO) defines health in the following terms: "Health is a state of complete physical, mental and social well-being and not merely the absence of disease or infirmity." In our post-genomic future, such complete physical, mental and social well-being could be genetically predestined for all and not just a genetic elite. Yet such superhealth wouldn't dictate how anyone's life should be led, nor what values they should hold. Living a uniformly disease-free life entails missing a hydra-headed diversity of physical malaise: a uniformly disease-free life as prescribed by the ethical monist is indeed, as Agar puts it when alluding to mental health, the "one best way for human lives to be". Lifelong bodily well-being nonetheless expands and diversifies a person's life opportunities, allowing a greater variety and richness of novel experience. There is an effectively unlimited diversity of ways to lead a life free from physical pain. Enhancement technologies can "be used to create humans as close a possible to the ideal state" of physically healthy, pain-free lives. So yes, coding for universal physical superhealth expresses a "monistic" conception of the good life inasmuch as the generic texture of bodily malaise will be absent. Such uniform good health "leaves no room for meaningful choice". But the ramifications of physical superhealth are pluralistic insofar as a richly textured variety of experiences can be savoured as a consequence of leading a physically active life, and from pursuing a diversity of life projects. So would a pluralist critic of utilitarian ethics have grounds for disputing that the new reproductive medicine mandates such physical superhealth - in the way Agar contests utilitarian claims that the new reproductive medicine will mandate psychological superhealth? Could prospective parents ever be justified in believing that healthy, pain-free lives for their offspring would really be better if interspersed with, say, a little neuropathic pain to afford extra diversity and contrast? On some fairly modest assumptions, inserting genetic code to promote such physical unpleasantness - in what would otherwise be a superlatively healthy life - is unethical. Yet by parity of reasoning, the same obligation to promote maximal health holds for lifelong psychological well-being too. This is not an illiberal or coercive policy prescription: no liberal-minded democrat will advocate forcing the individual to be healthy or happy. But in an era of post-genomic reproductive medicine, inserting or perpetuating genetic code in others that promotes or predisposes to psychological distress may be reckoned no less immoral than inserting or perpetuating genetic code to promote physical debility. Authoring - or sexually colluding in the propagation of - such code is more objectionable ethically than releasing computer viruses in inorganic computers, since organic malware is intrinsically harmful to sentient victims. Our tolerance of such dysgenic code today is really just a form of status quo bias. In common with bodily health, there is an effectively unlimited diversity of ways to lead a life animated by gradients of superhappiness. Yes, genetically preprogrammed mental superhealth could "be used to create humans as close a possible to the ideal state", so in one sense Agar is right: an applied ethic of invincible mental superhealth is indeed monistic. Ultimately, its application lays down the biological underpinnings of our sense of what matters. But a civilisation based on universal mental superhealth can potentially support a pluralistic diversity of values and lifestyles on a scale unimaginable today. Two senses in which this pluralistic diversity may be supported will be noted here. First, in contrast to the behavioural suppression and "learned helplessness" characteristic of depressive illness, the technologies of mood-enrichment tend to promote sensitization to a greater range of rewards. Thus dopaminergically enhanced incentive-motivation extends, not just our depth of motivation, but the range of stimuli we find potentially rewarding, whether such stimuli are artistic, interpersonal, musical, spiritual, psychedelic, sensual, athletic, intellectual, or other modes of experience too numerous to mention. The biggest risk of elevating mood is not fostering too little diversity, as Agar alleges, but too much: i.e. triggering an uncontrollable manic sensation-seeking and risky adventurism. Genetic mood-enrichment evidently needs to be pursued wisely. Hence the case for a matching intelligence-amplification. Second, and more counter-intuitively, in our post-genomic future even hedonic diversity could be genetically amplified, if so desired, without perpetuating suffering. This is because raising the affective floor of our lives diminishes hedonic diversity only if we don't also raise the affective ceiling. Whether our mature posthuman descendants will really want to explore both the depths of 7th Heaven and the summits of 7000th(?) Heaven above is obscure. The ethical utilitarian would enjoin us to stick to the highest echelons of the sublime rather than going slumming in its lower foothills - however exalted such hedonic foothills may be compared to squalid Darwinian norms. Future empirical investigation of all levels of reward pathway enhancement will presumably confirm this preference. In principle, hedonic contrast in our posthuman future could derive from fine gradations of the supra-sublime in virtual worlds beyond 7th heaven - subtle signalling shifts of exquisite well-being that suffice for flexible responses to a changing external environment. Either way, germline intervention can in principle make all experience intrinsically valuable by its very nature (i.e. benignly "monistic") and yet prodigiously varied in texture and narrative structure [i.e. pluralistic]. Agar denies such choices would be "meaningful" [to whom? ]; but subjectively, at least, the choices expressed will be intensely meaningful: heightened mood is typically associated with a heightened sense of significance, and this heightened significance may be multiplied a thousandfold (and more) in our genetically enriched successors. Whether the values and lifestyles of posthumans will really be so diverse is of course unknown. On an alternative scenario, perhaps posthumans will hit upon a narrow state-space of unsurpassable excellence - a secular analogue of the beatific vision - and elect to stay there indefinitely. But this is sheer conjecture. A common objection to radical recalibration of the hedonic treadmill is the claim that happiness is purely relative; and hence dips of diminished well-being would be perceived as emotionally painful if our hedonic set-point were dramatically raised. This isn't the case. Compare the lives of victims of chronic pain or depression today. Periods when such chronic pain or despair is less dreadful than other periods aren't thereby somehow pleasant; the "moderately" nasty days simply aren't as atrocious as the worst days. By the same token, experiences in a future era of sublime well-being that aren't quite so wonderful as others aren't thereby unpleasant: they are simply not quite as sublime. Just wonderful. The new biotechnology also undercuts a lot of traditional ethical debate in the philosophical literature. For example, maximizing utilitarianism is often charged with being a too demanding ethic. In the pregenomic era, classical utilitarianism apparently asks us to make sacrifices beyond the capacity of the Darwinian mind - for example, to give up a very large part of our income to anonymous strangers in the impoverished Third World. This kind of "heroic" self-sacrifice is psychologically impossible for ordinary mortals. By contrast, genetically amplifying the substrates of willpower and well-being - and indeed any direct reward pathway enhancements - will not call for heroic sacrifices, just a willingness to use good code over bad. Indeed insofar as we want our future children to be (super)happy, such germline interventions will not involve sacrifices at all, since new-born bundles of joy can be a source of vicarious pleasure. The pleasure to be derived from raising tantrum-throwing toddlers is more muted. Agar's objection will nonetheless strike a chord with many readers. For it isn't intuitively obvious that genetically programmed superhappiness tends to promote a greater diversity of lives and life projects, as argued here. This is because in a Darwinian world, our conception of life's joys is typically a lot thinner than our knowledge of life's manifold sorrows. Tolstoy famously observed [in Anna Karenina]: "All happy families are alike; each unhappy family is unhappy in its own way. "; but the same holds, Agar clearly feels, for (un)happy individuals too. Mirroring the nature of Darwinian life, far more negatively emotionally valenced words than positive words occur in the vocabulary of every human language; and of our core emotions [happiness, anger, fear, surprise, disgust, and sadness] only one is unequivocally pleasant. So pre-reflectively, Agar is right. Yet our intuitions systematically mislead us. The happiest people in a Darwinian world typically construe any sort of "monism" under that description as a boring prospect - and therefore repellent. By way of illustration, if right now you were offered the choice of watching either a movie about a world without suffering or a movie about a savage, violent world, you'd probably (if male) opt to watch the latter because the violent thriller sounds more exciting - even though the world without suffering might feel more exciting "from the inside". In the imagination of temperamentally life-loving extroverts, a sense of boredom is often the worst conceivable state of mind. But that's what's so misleading about describing an ethic of universal superhappiness as "monistic". Sublime post-Darwinian life can be consistently exhilarating; and the substrates of tedium eradicated altogether - even if its functional analogues are retained to preserve the critical discernment and self-insight lacking in the clinically manic. Thus all aspects of post-Darwinian life can be fascinating, but some aspects of post-Darwinian life can be even more fascinating than others. The only way to eradicate the humdrum and monotonous is to use biotechnology; and the only way to ensure that our children never suffer from the humdrum and monotonous is the ubiquitous use of germline enhancement technology. Strictly speaking, if maximum diversity were our sovereign value, then we should aim to devise novel forms of adaptive complexity in the kingdom of pain as well as pleasure. But if diversity is of only subordinate or instrumental value - i.e. a means to avoid tedium and the risk of getting "stuck in a rut" - then this grotesque conclusion fails. Agar's pluralistic celebration of human diversity certainly does not extend this far: Agar maintains that our procreative goals should be subject to the constraint that we do not harm the new lives we bring into being. Here is the heart of the issue: Agar's position is designed to be consistent with the "harm principle" articulated by J.S. Mill: "That the only purpose for which power can be rightfully exercised over any member of a civilised community, against his will, is to prevent harm to others." (On Liberty, 1859). Yet endowing new beings with Darwinian genes for anxiety, depression, jealousy and the standard recipe for human primates is profoundly harmful to their subjective well-being. If you doubt this, then maybe Nature has dealt you a remarkably lucky hand from the genetic deck. Agar could presumably respond that this analysis is unfair. The great majority of parents would deny that they are harming anyone by fulfilling their desire to have children. Rightly or wrongly, parents in the era of sexual reproduction will justify the intermittent suffering that their offspring are genetically destined to undergo on the quasi-utilitarian grounds that such suffering is outweighed by life's joys. Even victims of an unhappy childhood will commonly interpret their own lives in this sunny light. Only a few pessimistic philosophers and negative utilitarians would go so far as anti-natalist David Benatar in Better Never to Have Been: The Harm of Coming into Existence (2006). Yet the imminent Reproductive Revolution is poised to shift the terms of this debate. When sexual reproduction was the only game in town, the creation of potentially suffering children could be rationalized on the grounds that life's sorrows are inseparable from its joys; you can't have the sweet without the sour; and so forth. Life, so to speak, is a package deal. However, when we are presented with the eugenic opportunity to choose the genetic make-up of our children, our complicity [or otherwise] in the vicious side of the life deepens. As our knowledge increases, that complicity becomes complete. By choosing one set of allelic variations over another, you can harm the interests of your future child at least as much as if you were physically and/or emotionally abusive of that child. Likewise, by choosing not to use the new germinal choice technologies, traditional-minded prospective parents will be responsible for bringing new suffering into the world in a much more premeditated sense than by having children today. The distinction between liberal eugenics and illiberal eugenics is going to become more complicated as our medical genetic understanding grows. In general, an ethic of extreme liberalism does not dispute that legislation and law-enforcement are needed to protect vulnerable children in society from abusive parents, and even from well-intentioned parents whose actions grievously endanger the well-being of their children (e.g. Jehovah's Witnesses who deny their child a life-saving blood-transfusion). So as medical science deciphers the genetic basis of human misery, society may increasingly feel compelled to protect vulnerable prospective children from the grievous harm deriving from abusive, neglectful or ill-advised genetic choices - or the simple parental abdication of genetic responsibility. Of course this scenario is an ethical and legal minefield. The regulatory framework within which the Reproductive Revolution will unfold can scarcely be guessed. 2) Universal superhappiness entails devaluing "perfectly worthwhile" troubled lives. Agar's second objection to the idea we have an obligation to ensure maximal genetic well-being for our children rests on the argument that striving for maximal hedonic excellence entails devaluing the lives of the constitutionally discontented. The classical utilitarian claim that we have an obligation to create maximally happy children, Agar suggests, entails slighting the "perfectly worthwhile" lives of troubled souls in the world today. Just quite how troubled/pain-racked a life must be for such a life to cease being "perfectly worthwhile", let alone to fall below the threshold of a life minimally worth living, is a vexed topic that I will not delve into here. There is a vast philosophical literature on what might count as worthwhile lives and controversial marginal cases. Derek Parfit's infamous Repugnant Conclusion draws a counter-intuitive conclusion from the purported application of a utilitarian ethic for population ethics as a whole. Yet Agar sets up a false dichotomy. In an era of mature post-genomic medicine, the critical question is not the absolute value [or otherwise] of distressed lives, but the opportunity cost of creating such lives in terms of opportunities forgone to create richer lives. In a future world, we cannot create an infinite number of new beings, genetically enriched or otherwise. So when we choose whether to create either 1) a Darwinian child who is (genetically predisposed to be) anxiety-ridden, depressed, angry and hostile; or 2) a posthuman child who is both superhappy and superintelligent, could it ever be ethical to choose the former - even if we charitably redescribe the angry, hostile depressive as a model of sombre sagacity? Rightly, we feel queasy today about the ethics of allowing deaf couples deliberately to create deaf children by design - what has been euphemistically dubbed "negative enhancement technology". But creating or perpetuating code for depressive or anxiety-ridden children is worse, since, unlike congenitally deaf people, anxious depressives are guaranteed a low quality of life. In one sense, Agar is clearly correct. The classical utilitarian is committed to affirming that, other things being equal, a life packed with subjectively valuable experiences is more valuable than a subjectively impoverished life. The "other things being equal" caveat is important because it is possible that the hostile depressive will act altruistically to create valuable experience for others - though it is perhaps just as likely s/he will spread the negativity reflective of his dark and angry mood. Conversely, it is possible that a life packed with subjectively valuable experiences will cause suffering to other sentient beings - if the superhappiness is wholly self-regarding. Also, it's important to note that the lower value placed by classical utilitarian ethics on pain-ridden lives shouldn't be misconstrued as a license to treat the constitutionally miserable as second-class citizens. On the contrary, it imparts all the greater moral urgency to enabling the miserable to be happier; indeed the negative utilitarian argues that misery-reduction should be our overriding moral goal. Yet this isn't the issue at stake here. If, plausibly, we will shortly have the opportunity to create superhappy, superintelligent and super-empathetic children in preference to traditional Darwinian children, haven't we the obligation to do so, and not merely the right to do so, as Agar maintains? The language of "enhancement" in this context is parochial, time-bound and unfortunate: it can suggest icing the cake (if not gilding the lily). By the standards of mature posthumans, all Darwinian life may seem profoundly retarded - emotionally and intellectually. Today, remedial gene therapy for the profoundly disabled or sick probably counts as the least controversial prospective use of gene therapy; but by the enlightened criteria of a future civilisation, perhaps such remedial gene therapy needs to be applied to archaic humanity as a whole. Not least, all contemporary human reproduction is dysgenic insofar as it promotes the spread of suffering. Traditionally, eugenicist critics of human dysgenics have focused on intelligence (or the lack of it). The utilitarian will argue that the focus of dysgenic worries should instead be on emotional well-being (or the lack of it). Since the dawn of humanity, our superior hominid intelligence has been deployed hunting, trapping and killing members of other species, and oppressing members of our own, in ever more fiendishly ingenious ways so as to maximise the inclusive fitness of our DNA. Accordingly, it's difficult on any compassionate ethic to view high IQ as an unmixed blessing. However, the great redeeming feature of human intelligence is that it will allow us to transcend our blood-stained evolutionary origins and rewrite our own source code. Eventually, creating any primitive Darwinian humans - and their transmissible pathologies of mind - may be reckoned child abuse. This speculative prospect still sounds fanciful today. Where child abuse is endemic, it may be hard to discern at it as such: after all, it's "natural". Thus Agar states: "The notion that we must genetically engineer every human being to be as emotionally upbeat as possible is absurd". Agar's language here is loaded: regrettably, even cool-headed analytic philosophers can find it difficult to avoid rhetorical devices in bioethical discourse. First, let's analyze the term "upbeat". In popular usage, we speak of how politicians convey an "upbeat" message. CEO's deliver an "upbeat" assessment of their company's growth prospects. The word "upbeat" suggests a shallow, one-dimensional, and perhaps unjustified optimism. As Agar notes, it is indeed "hard to believe" that we have an obligation to produce upbeat children. However, replace "upbeat" with "sublimely happy" and the rhetorical force of Agar's argument is blunted. Secondly, consider Agar's claim that universal superhappiness is "absurd". This may describe our pre-reflective moral reactions; but it's not a logically compelling argument. By the same token, members of a future civilization founded on a biology of sublime well-being might find it "absurd" to propose creating chronically discontented and anxiety-ridden creatures like their hominid ancestors. What weight does Agar give to their intuitions of absurdity; and why? In fairness to Agar, utilitarians can be guilty of emotionally loaded language too. But the lexicon of utilitarianism, with its "felicific calculus" and "principle of utility", is characteristically colourless compared to that of its critics, as the name "utilitarian" itself suggests. Bentham was cuttingly described (by Marx) as "a desiccated calculating machine". Indeed it is the absence of any adequately evocative label that detracts from the appeal of utilitarian ethics to all but the most rational, systematizing and hypermasculine philosophical minds. Again, Agar's objection will nonetheless strike a chord with many readers. Not least, any exaltation of the sublime and posthuman seems to devalue one's own comparatively mediocre existence now. Yet the analogy with physical health is instructive once more. The sedentary couch-potato enjoys only mediocre physical well-being compared to the Olympic superathlete; but this mediocrity isn't a license to discriminate against couch-potatoes, let alone the physically sick. Nor should we aim to create a genetic recipe-mixture of temperamental couch-potatoes and Olympic athletes in misplaced celebration of human diversity. On the contrary, a utilitarian ethic dictates we should seek to endow everyone with the capacity to feel as physically superwell as Olympic athletes. As reproductive technology matures, we have an obligation to improve the physical health of our sentient fellow creatures. In the case of our future children, it makes no sense ethically to endow them with lousy genetic code and then try to remedy its corrupting influence later. On a utilitarian ethic, we are obliged to endow our children with the genetic foundations of mental and physical superhealth. In fact, even the non-utilitarian ethicist should weigh the case for maximising mental and physical superhealth. Universal genetic superhealth can lay the richest possible biological foundations for whatever forms of (post)human excellence the non-utilitarian holds most dear. Treated as a prediction rather than a prescription, the thrust of Liberal Eugenics is probably correct - at least for the near-term future. Later this century, prospective parents will increasingly choose the genetic make-up and personalities of their future children. Yet it's unclear how many generations of quasi-liberal eugenics will be practised before the advent of superlongevity makes free reproductive choices on overcrowded Earth ecologically impossible. Will an era of post-Liberal Eugenics follow? Maybe; but here we enter the realm of speculative science fiction.